There is plenty of misinformation around vitamin A. Online chatter cites it as a cancer-causing ingredient and others warn pregnant women away from it. Vitamin A is the one ingredient in dermatological studies with the safest record, delivering the most remarkable results for your skin. We chat to our founder Lucy and find out the truth on vitamin A and what it can do for your skin. I am sometimes asked about vitamin A and its safety due to a lot of online chatter citing it as a cancer-causing ingredient. This is simply not true. The misinformation around vitamin A came from a very small study performed on mice and has since been debunked widely by dermatologists. Other negativity stems from people coming into contact with extremely high doses, such as 10kg containers. For instance, MSM sulphur, a hugely beneficial, natural ingredient, taken in small doses has the ability to regenerate and repair tissue. However, taken in extremely high doses, it can be highly toxic. This is the same for vitamin A. It is the one ingredient in dermatological studies with the safest record, delivering the most remarkable results. It is the go-to for all dermatologists treating aged skin. We formulate this ingredient according to FDA guidelines. Vitamin A works by prompting surface skin cells to turn over and die rapidly, making way for new cell growth underneath. It also prevents the breakdown of collagen and thickens the deeper layer of skin where wrinkles originate. Vitamin A also sloughs off brown spots [pigmentation] and curbs the production of melanin, clarifying and evening out skin tone. It has also been proven to normalise [repair] UV damage to the epidermis and regenerate skin damaged by UV radiation. From a scientific point of view, the primary function of vitamin A is to speed up cellular turnover, replenishing the epidermal layers with fresh new cells. When skin reaches this state, it is extremely important to use sunscreen to protect these new cells —think soft baby skin that hasn't matured to environmental factors. We recommend avoiding sun exposure, especially between the hours of 10 a.m. and 2 p.m., when the sun’s rays are most intense. Wear an SPF of 30 or higher, and cover exposed skin with protective clothing, such as a long-sleeved shirt, pants, and a wide-brimmed hat, when you're outside. Have a question you'd like to ask Lucy? 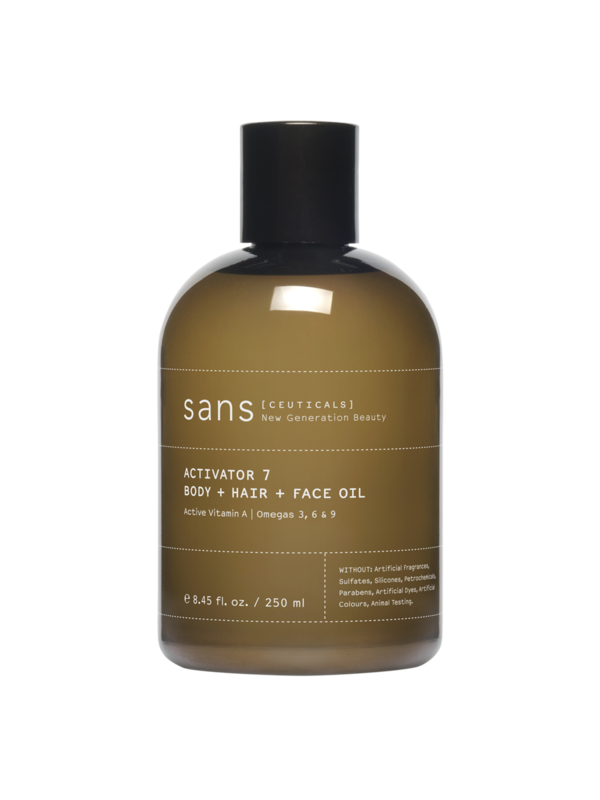 Loaded with both vitamin A + E, Activator 7 Body + Face + Hail Oil is your bathroom cupboard staple for building healthy, luminous skin.